The idea is that we must press forward along the path (yellow brick road) until we reach home (Eternal Life). It turned out really cute. I have a few tutorials for decorations in this post, and my friend Kim at Life’s Journey for Perfection has the program and printables. 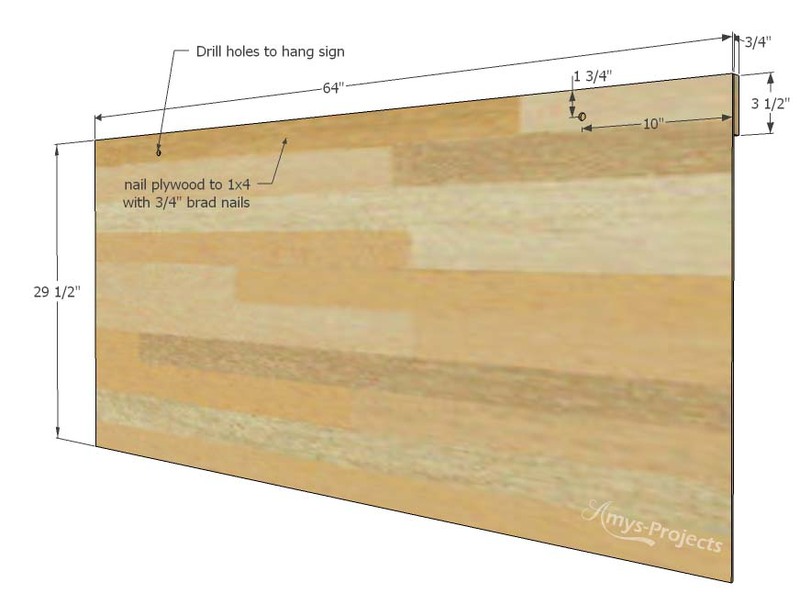 Use the dimensions to trace out the pattern on the plywood. 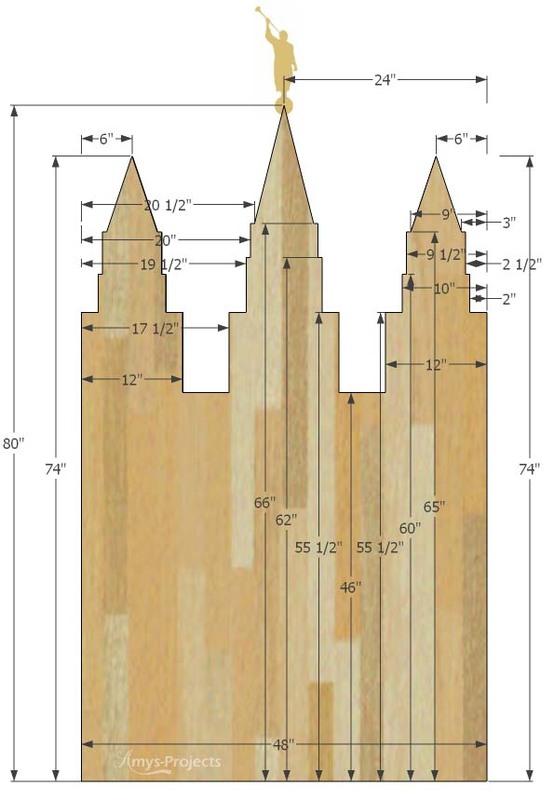 The temple is symmetrical, so the measurements can be used to mark both sides. 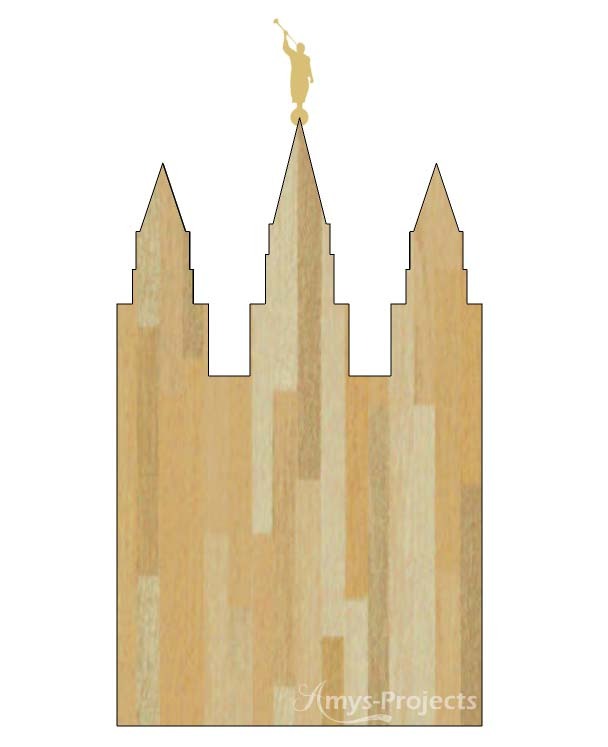 You can download a Moroni pattern here moroni for temple. The temple is very easy to cut out using a jig saw. 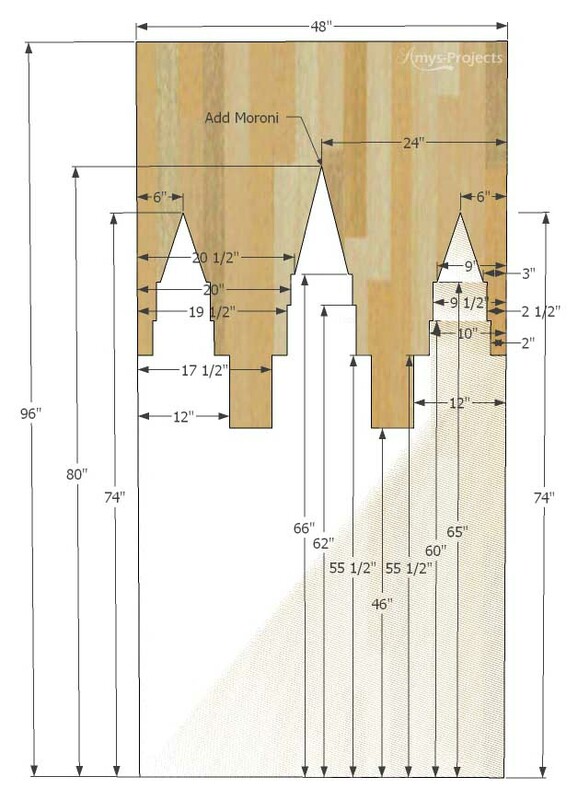 You’ll want to make Moroni’s trumpet a little thicker than the template, so it’s a little more stout. Lightly sand the edges. Prime the plywood with paint primer, and when dry, paint white (I used Behr Ultra Pure White). I used a little gold spray paint* on Moroni. After the program, I noticed all of the girls taking pictures with their friends in front of the temple. It made a cute backdrop. 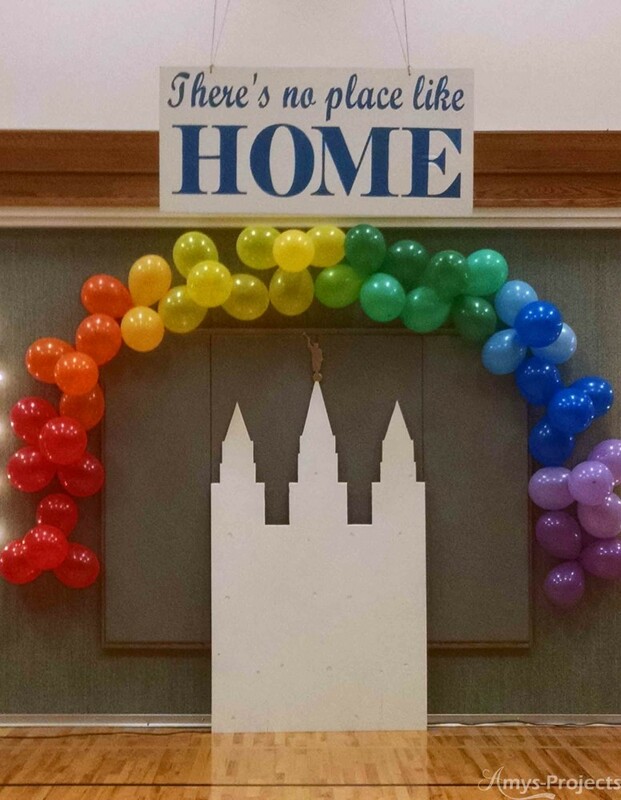 The ‘There’s No Place Like Home’ sign is a scrap piece of plywood (actually the backside of a piece of bead board). It is 64″ long and 29 1/2″ tall, I nailed a 64″ long piece of 1×4 to the back so it would hang straight, the bead board is a little flimsy. I painted the back side of the bead board white, like the temple. Then I printed out the words (I have horrible handwriting and hand painting skills, so I always make myself a template.) 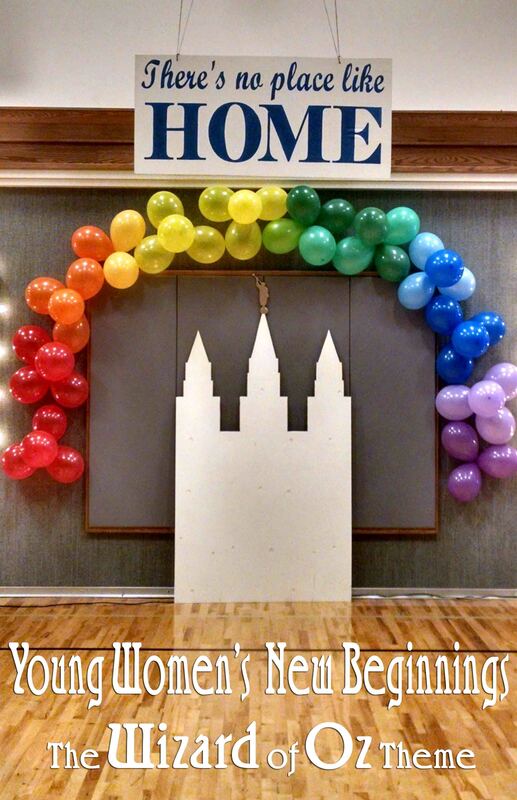 There’s No Place Like Home pdf template: theres no place like home. I tape together the words, then tape it to the board. I use a razor blade to cut out the letters, leaving myself a paper stencil, then lightly ‘pounce’ paint onto the board. Remove the paper when done painting, this is not a perfect method, but it works well. It wouldn’t be the Wizard of Oz without a rainbow, I dare you not to break out in song ‘Somewhere over the rainbow’… I would suggest getting about 8 or more balloons in each rainbow color (red, orange, yellow, green, blue, and purple). I blew up the balloons and then tied them together in 2’s. Each group of two, I wrapped together to make a cluster of 4. I tied a 18″ or so piece of string around the 4 cluster knot and used a push pin to attach the cluster to the wall. This worked really well and was very economical. 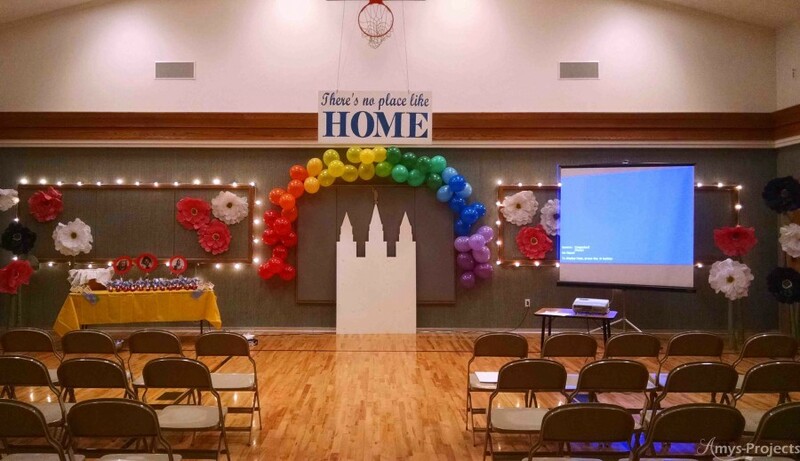 The giant tissue paper flowers were decorations that one of the leaders made for her son’s wedding this fall. They were the Perfect touch, since they resemble poppies! You can find the tutorial to make the flowers here. 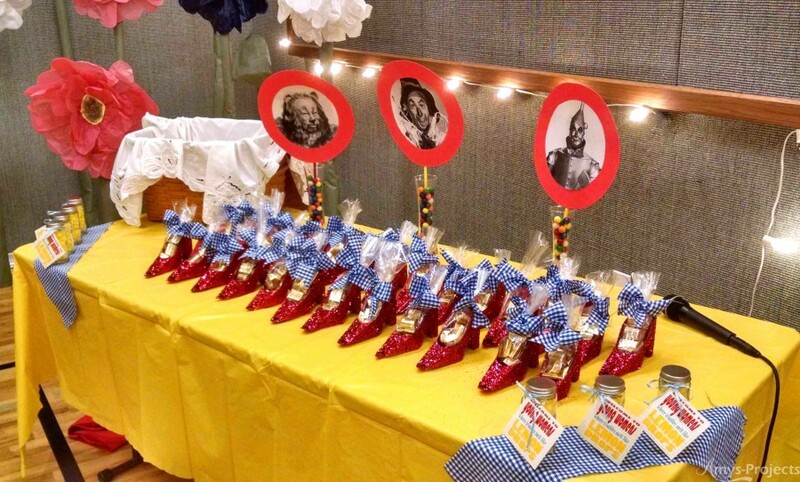 We thought it would be very fitting to have the handouts for the girls be ruby red slippers with gold nugget treats topped off with a blue gingham bow. The slippers are made from a simple Paper shoe-pattern using red glitter paper* (red stock paper will work great too). The refreshment for the evening was Auntie Em’s homemade bread and jam. We had baskets or trays covered with blue gingham cloth. Sorry I forgot the get a picture of the refreshment table, but it was cute. It was a great night and I think the YW and the incoming beehives had a wonderful time! Check out our Press Forward Arrow Craft.